A cobbler's son in Vladimir had been sent to a school by a rich lady who desired him to become a priest. His father took great pride in the boy, and cleared a corner of his shop where he might sit in quietness to pursue his studies undisturbed by the rest of the children, Like all other shoe-makers he knew many old stories, and, believing these would increase his son's knowledge, he was wont to relate them to him as he patched and stitched the boots that his customers left to be repaired. "What are you reading about to-day?" he asked his son, who was poring over a book in his corner. "The history of Ivan the Terrible, Father. He was a great Tsar, who did much to make Russia rich and powerful." "Does your book tell you how many Tsars called Ivan sat on the imperial throne?" "No, Father; were there more than one?" them I know little or nothing, but I know something of two. One was Ivan called the Terrible, of whom you are reading, and the other was the first Ivan of all. This first Ivan reigned in the days when the Tartars oppressed the people of our country, and plundered them without mercy. He delivered the whole land from the Tartar yoke." "He must have been a mighty Tsar, indeed." "And yet, when he was a boy, he lived the life of a beggar. The Tartars sought to slay him soon after he was born, but his nurse exchanged him for the child of a poor woman who lived in this ancient city, while her own child was reared as a Prince in Moscow. Would you like to hear the story of how little Ivan became a Tsar?" "Indeed I would, Father," exclaimed the boy. "Then come here and sit beside me," said the shoemaker, "so that your knowledge may be increased." 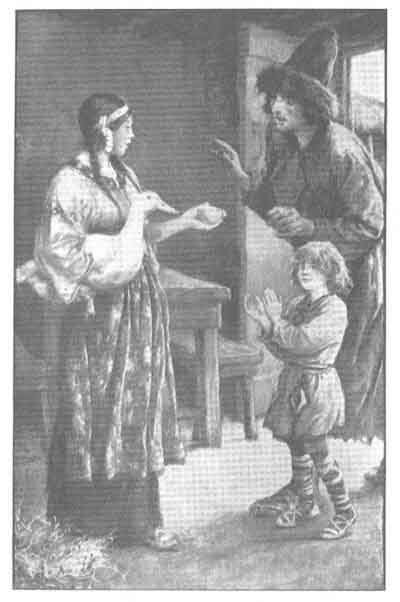 Little Ivan was a comely boy, who lived in a hut on the outskirts of Vladimir with his father and mother, who were very poor. He had bright eyes and a noble brow, and the rich people smiled to him, being attracted by his countenance, although he went about in rags. In summer-time he fared well, for he was given alms by many, but in winter when food became scarce the boy felt glad if he was able to procure one meal a day. He learned how to be contented with little. Once his father came home from the town, on a cold and bitter evening, with a small loaf of black bread. It was all the food he could purchase that day. He cut it into three portions, one for his wife, one for little Ivan, and one for himself. Then he sat down before the fire to enjoy the warmth, for he had wandered about through the cold streets since early morning. Now there crouched behind the stove in that poor hut a grim spirit, named Krutschina, which signifies "the Sorrowful One". She watched the man munching slowly, and suddenly stretched out her grisly black hand and snatched away his portion of black bread. Then she shrank back again into her hiding-place. "Alas!" cried the hungry man, making obeisance to the spirit, "restore to me my black bread, else I will die of hunger." a duck, which will lay a golden egg every morning." "So be it, Krutschina," the poor man answered. "Thinking of the duck and its golden egg, I will go to bed forgetting my hunger. But tell me, first, where I will find this wonderful bird." Said the spirit, "When you go towards the town to-morrow, you will see a pond. In the pond there will be a duck; seize the duck and hasten home with it." "Very well, Krutschina," the man said; "I will do as you advise me." Then he went to bed, and having overcome the pangs of hunger with a strong will, fell fast asleep. At dawn next morning he rose and left his hut to hasten towards the town. To his great joy he soon found that the spirit had spoken truly. He beheld a pond, and in the pond a duck. So he seized the bird at once and returned home with it. Little Ivan clapped his hands with joy when he beheld the duck, which the man handed to his wife, saying, "May it lay an egg soon! We have need of gold." "May it be our salvation!" the poor woman exclaimed. As she spoke, she placed the bird in a basket and covered it over carefully with a sieve. When an hour had elapsed, she lifted up the duck and found that it had laid a golden egg. [paragraph continues] Great was her joy. She called her husband and little Ivan, who had gone outside to chop wood, and they hastened to her side. The boy clapped his hands with joy, his eyes meanwhile sparkling like moonlit water. "One golden egg each morning," his mother said. "Such is our good fortune now." The poor man was feeling hungry. He said nothing but "Give it to me." He thrust the egg into his bosom and hastened towards the town. A merchant, to whom he showed it, paid him down, without hesitation, a hundred roubles, which he lifted up without excitement, as if he was accustomed to handling large sums of money. Then he made his way to the market-place and purchased a goodly quantity of provisions. Little Ivan danced with joy to see his father returning from the town, carrying food in abundance for the starving household. Next morning the duck laid another golden egg. The man did not hasten to the town with it. He thought he would wait for a week so that the worth of this wonderful bird might be tested. It did not fail or disappoint him. With each new day came a new egg, and the owner of the duck soon found himself wealthy. He kept his secret, and his wife and son never revealed the source of the family fortune either. After disposing of several eggs the man built a large house, which he furnished exceedingly well. Then he purchased a shop and began to trade with profit. As time went on, little Ivan's father grew very rich; but he seemed never to be satisfied. The more gold he made the more he desired to make. He rubbed his hands gleefully every time he thought of the duck which laid a golden egg each morning. The Man who Eats this Duck will become a Tsar. He placed the bird down on the floor at once, and said nothing regarding his discovery. Well he knew that neither his employer nor his wife could read. "You must not tell my husband that you have seen the duck," the woman pleaded. The clerk shook his head. "I will promise nothing," said he. "Keep the secret I have revealed," she urged softly, "and I will give you much gold." about the bird, you have broken a magic spell. It will never lay another golden egg." The woman believed him. "Do not tell my husband," she repeated. "I will reward you for your silence. Fortunately we have enough wealth to last us all our days. Besides, my husband makes much money in trading. He will not miss the golden eggs now." Said the clerk: "Very well. I promise not to confess against you. But he will discover the truth all the same, for when he returns home to-morrow the duck will inform him of what has happened." The woman began to weep. "Alas!" she cried, "I fear to meet my husband. What can I do?" Said the clerk: "The only thing you can do now is to kill the duck." "But what explanation can I give to my husband for killing this wonderful bird?" she wailed. Said the clerk: "Kill it and cook it, and I will eat it. The magic of the bird will thus pass to me, and I will be able to bewitch your husband and cause him to forget that he ever possessed a duck which laid golden eggs." Like a child, the woman did as this cunning fellow advised her. She slew the duck, plucked and cleaned it, and thrust it into the oven. Then the clerk said: "I will return to the shop now. Come with me and pay over the money you promised. Then I will eat this duck and proceed at once to bewitch your husband." The woman said: "Very well. Let us get done with the business as quickly as possible." As she spoke she threw a cloak over her shoulders and hurried out of the house with the clerk. Little Ivan had risen early that morning to go skating on the frozen river. He returned home sooner than usual, feeling very hungry, and began to search through the house for food. Opening the oven, he saw the duck roasting and smacked his lips. "How lucky I am!" he exclaimed. "I will have a rare feast before mother returns." When the duck was thoroughly cooked he pulled it out, placed it on a large plate, and sat down at a table to devour it. He never tasted sweeter food in his life. The more he ate the more he desired to eat, and he went on eating until nothing was left but the bones. Then he leapt up gladly, and seizing his skates returned to the frozen river again. In time his mother returned home. She laid out a table and then went to the kitchen to obtain the duck. To her horror, she discovered that it had been eaten up. The clerk arrived a few minutes later. When he learned what had occurred he became very angry, and exclaimed: "You have cheated me, false woman! You have eaten the duck yourself. Now nothing can save you from your husband's wrath." be a Tsar," he said to himself, "I am now a wealthy man, for that foolish woman has allowed me to become possessed of the greater portion of her husband's ready money. I shall leave this town at once and go and live in a foreign country." When Little Ivan's father came home next day he looked round the house, saying, "Where is the duck?" His wife followed him. "I do not know," she kept repeating. Little Ivan amused himself that morning building a snow house in the back yard. His father called to him: "Have you seen the duck? I cannot find it anywhere." The boy ran towards his parents and said: "Yesterday I returned from skating, feeling very hungry. I could have eaten an ox. I opened the oven and found a roasted duck, which I pulled out and devoured, leaving nothing but the bones. But whether or not it was the duck you are searching for I cannot tell." His father flew into a sudden passion, and not only whipped the boy, but turned him out of the house. Then he scolded his wife, who wept bitter tears. Afterwards he went to his shop, and discovered that the clerk had ruined him and fled away. He caused a search to be made for the scoundrel, and after several days had gone past was informed that his dishonest servant had been robbed and slain by a band of fierce thieves, who infested a forest about two hundred versts from the town. So it came about that this man who had owned the magic duck, which brought him good fortune, became very poor again. He returned to the little hut in which he had been wont to dwell, and there he mourned the loss of his foster-son, whom he had sent away in his wrath. Little Ivan had gone on a long journey. After he left his home he walked onward until he reached a village five versts south of Vladimir. There he met an old woman, who spoke to him, saying: "Why are you weeping so bitterly? You are young and strong, and should be happy indeed." "Alas!" answered the lad, "I have been sent away from home for eating a duck which laid every day a golden egg." "You have done a great wrong," the old woman told him, "and it is now your duty to repay the loss which you have caused. My advice to you is to travel southward until you reach Moscow, the capital of the next kingdom. Enter through the gate and accept the first offer which is made to you." "Very well," answered the lad, "I shall do as you advise me." "HERE COMES OUR TSAR! LONG LIVE OUR NOBLE TSAR!" The lad was greatly astonished. Soldiers gathered round him, and then the chief citizens came forward, and, having knelt before him and kissed his hands, they led him towards the royal palace on the Kremlin. Crowds thronged all the streets that Little Ivan passed through, and they shouted words of loyal welcome. The lad gazed about him with wonder, but he could not help smiling and bowing to see so many kindly and happy faces. The more he smiled the more delighted the people became. chanced to visit their capital. In their hearts they were all firmly convinced that he would grow up to be a wise and just ruler, who would devote his life for the good of the people. "LONG LIVE OUR NOBLE TSAR! LONG LIVE OUR NOBLE TSAR!" It seemed for a time to the lad that he must be dreaming. But he realized at length his good fortune, and when he did so, he thought of his father and mother. He felt that he could not live happily unless they were beside him, so he called before him a gallant knight whose name was Luga, and spoke to him, saying: "Go to my native country, which is Vladimir, and salute the Tsar. Say I greet him, and desire above all things that peace should prevail between my kingdom and his. Ask him to favour me by permitting my father and mother to come here and dwell in my palace, because my heart yearns for them." The knight bowed before the new Tsar, and hastened to obey his command. Before a month had gone past he returned to the palace with Ivan's father and mother, who wondered greatly why they were ordered to appear before the mighty ruler of Muskovy. They were conducted to the throne-room, and to their great astonishment beheld their Ivan sitting on the throne, clad in rich robes, and wearing a dazzling crown upon his head. Said Ivan: "Father, you turned me away from your home. Now I have brought you to mine. Promise me that you and my mother will dwell here with me for the rest of your days." The old man was overcome with joy, and wept glad tears, as did his wife also. Ivan descended from the throne and kissed them both. Then he bade his servants to bring them royal garments, so that they might be fittingly attired to sit at his royal table. Ivan grew up to be a wise and powerful ruler. He acquired such great wealth that he was surnamed "Kalita" ("the Purse"). Not only did he reign over Muskovy, but also in time over Novgorod, which had been long years without a Tsar, and over Vladimir, the Tsar of which had been driven from his throne by the Tartars because of his folly and greed, and became an outcast among men. kingdom, he did his utmost to promote trade by founding many fairs and marts, which yielded imperial duties and enriched the state. Many merchants came from foreign countries in Europe and Asia, and Russia became a vast market-place. A great and good Tsar was the first Ivan. His name will live for ever.